Dr. Fred Urquhart discovered the location of the monarch overwintering sites in Mexico, after pursuing migrating monarchs for nearly 40 years. He told the world in the August, 1976 issue of National Geographic magazine. However, he did not reveal the actual location of the butterfly colonies, even to other scientists. Nevertheless, Dr. Lincoln Brower and Dr. Bill Calvert were able to find the sites by following two geographic clues they found in the article. The scientists were able to pick out the spot on a map—and travel there—by knowing only that the butterflies were 1) in state of Michoacan and 2) at an elevation of 10,000 feet. Read the story below, as told by Dr. Bill Calvert. 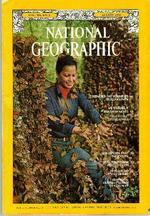 By 1976, Lincoln Brower was very familiar with the monarch butterfly whereas I knew virtually nothing about it at all. He had already investigated the chemistry of the creature and had discovered that protection was conferred upon monarch larvae and adults by virtue of the larvae eating poisonous milkweeds and incorporated some of the poison into their own tissues. Many, but not all, predators that ate them became sick and learned to avoid monarchs and all butterflies that looked like monarchs. This relationship became the keystone of a new discipline launched by Brower and others called ecological chemistry. At that time I was working in Amherst, Massachusetts on a project studying tent caterpillars. I knew of Brower's reputation, but had not met him until after an afternoon seminar when we chanced to talk of the monarch migration in my home state of Texas. I hadn't been home in some time and was feeling a little homesick. I volunteered to make a collection of migrant monarchs in Texas for his studies. I learned a great deal about monarchs that week, mainly that they were well ahead of me. I had to go into Mexico to catch up with them and make the collection. After returning to Massachusetts, we began to talk about the article published in the August National Geographic magazine by Fred Urquhart about the newly discovered monarch overwintering sites in Mexico. Brower had written Urquhart asking for the location of the Mexican colonies so he could use them in his studies. Urquhart refused to disclose the location of the colonies — even to the scientifically renowned Brower — citing a need for secrecy to protect them. We began immediately to dream and scheme about locating the overwintering colonies ourselves. We found two facts mentioned by Urquhart in his articles especially interesting. These were the altitude of the colonies and their location in the state of Michoacan, Mexico. The state of Michoacan is huge, but it you draw lines around the 3000-meter contour (~10,000 feet), you will find that only a few massifs extend above this altitude. It was a simple matter to find a good map showing these contours. It was a bit harder to mount an expedition to the town of Angangueo smack in the middle of the highlands of Eastern Michoacan. With a handpicked group of friends and Mexico experts in a beat-up borrowed truck, we drove down from Texas, presented our butterfly sample pressed between plastic sheets to the mayor of Angangueo. He was astonished that anyone would be interested in such a creature, but willingly arranged for his nephew to guide us up the mountain where the monarch wintered in the millions. After a day of hard trekking at 10,000 feet elevation, we arrived at the colony about dusk and, after catching our breath, gaped at the astonishing spectacle of millions of monarchs gracing a mountain glade in the mist of a tall cypress forest. In spite of the speed in which we found what became known as the Chincua colony, it was a wonder that we had found it at all. The map published in the August National Geographic Magazine shows the sites to the hundreds of miles north of where they actually are. One of the articles mentions their location in the Sierra Madre mountains, whereas the butterfly colonies are located in the Transvolcanic Belt. National Geographic makes excellent maps. We used one of theirs to locate the massifs described by Urquhart. Yet the map in the article was way off. Could they have been trying to confuse us? Maybe - we will probably never know. The first-discovered colony was located in a cypress forest. This turned out to be uncommon. The cypress forests share a high altitude habitat with firs (known locally as Oyamels), a few pines and some oaks. The dominant species is Oyamel. Most of the high massifs that we outlined on the National Geographic map had Oyamel forest. The distribution of Oyamels in Mexico is extremely limited. They are thought to be remnants of forests that were much more extensive when the climate was colder and wetter. The forest retreated up the mountainsides to retain the cool, moist climate to which the trees are adapted. The Oyamel forests are confined to the high massifs, and the high massifs are few and far between. It is likely that the monarchs seek out these high mountain habitats for the same reason the Oyamel forest ended up there--it's cool and relatively moist up there at a time when the rest of that part of Mexico is parching in the dry season.